Antennas for 50, 432 and 1296 MHz in the tower at 15 m AGL and 55 m ASL. The 5.5 m EME dish for 432 MHz and up, now with W2IMU feed horn for 23 cm, is visible behind the shack. The QTH is situated 1 km from the sea and the antennas in the tower have sea view from about 170 deg to 350 deg azimuth. I got my ham license in 1973 and started on 144 MHz and followed with 432 MHz (1974), 1296 MHz (1975), 2304 MHz (1977), 50 MHz (1990), 10368 MHz (1993), 24192 MHz (1998) and 5760 MHz (2012). One of my main interests for more than 20 years have been 50 MHz DX activity. For the moment I also work 10 MHz and 28 MHz CW. In the tower I also used to have my 10 GHz and 24 GHz rigs. For the moment my 10 and 24 GHz activity is portable only. 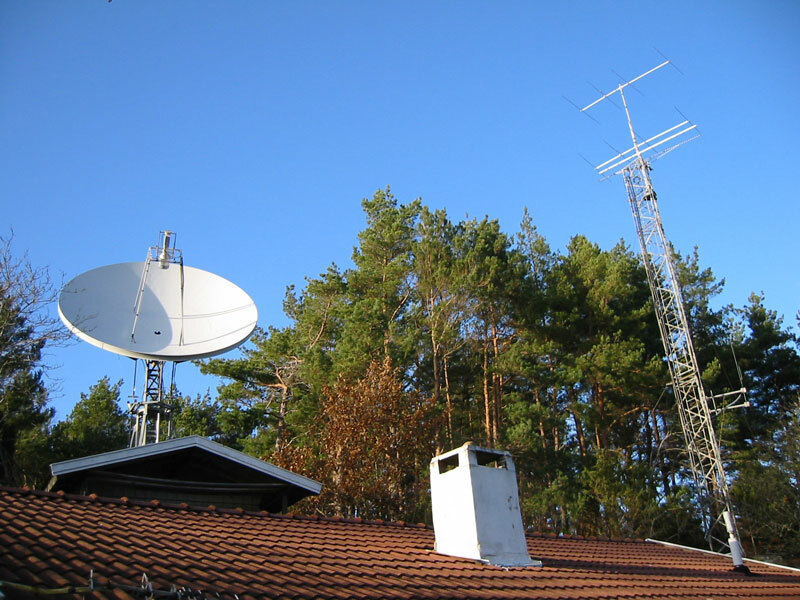 In 1984 to 1989 I worked EME on 1296 and 2304 MHz from JO66EW with a 5 m dish. Today I work EME on 432, 1296 and 5760 MHz with the 5.5 m solid dish. To celebrate my upcoming 40th anniversary of having a HAM license and 30 years in EME, I got myself the "vanity" call sign of SG6W. It has a nice flow and rhythm on CW. It also contains more "energy" than SM6FHZ. Other interests are cooking, growing chili and orchids as well as designing and building radio equipment.